Local quilting guilds have created seven quilts contributing to CSJ’s STEPS program. RUTLAND — When Kathy Budd sews a quilt, it becomes much more than just pieces of fabric stitched together. For her, she says, it’s more than just the physical task, or even the final product. For her, every quilt has a story. This year, that story is again being shared with incoming students in the STEPS program at College of St. Joseph. Students Taking an Effective Path to Success (STEPS) is a full-time residential program for youth transitioning out of foster care and into college. 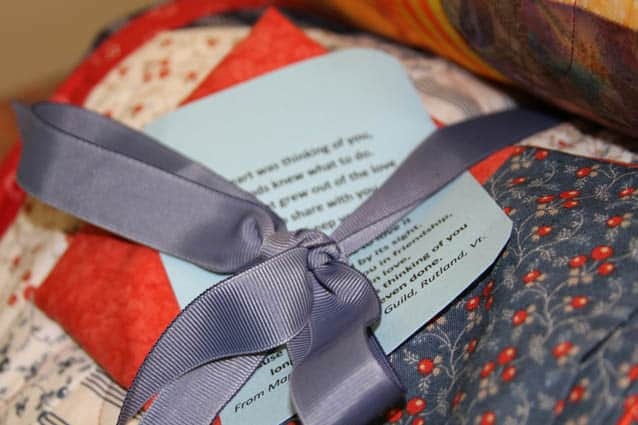 Several years ago, Budd and her partners within the Maple Leaf Quilters Guild decided they wanted to share their quilts to brighten the day for others. After some research, they found Project Linus, a program that provides ill, traumatized, or children otherwise in need with new, handmade blankets. They worked with the southern Vermont chapter for a year until the guild decided they wanted to continue their efforts, with a focus more on the local community. After realizing the group could positively impact the lives of locals with comfort blankets, they set out on a search to find an organization that would be a good fit. The guild had already been regularly donating to the hospital and other area nonprofits. Then, the guild’s former president, Ann Turner, shared information about the College of St. Joseph’s STEPS program. “We all went, ‘That’s it!’’’ Budd said. The first year Budd and the guild produced quilts for the STEPS students was 2013. Given the guild generally meets September through May, it was a great accomplishment when they received 20 twin-sized quilts. In 2014, Budd and her partners delivered 10 quilts to the program’s new students, along with handmade pillowcases and pillows to accompany them. This year, the Maple Leaf Quilters Guild got a little help from new friends. After hearing about the quilting project and the College’s program, the Community Guild of Mount Holly contacted the group to see how they could contribute. Together, the two groups were able to provide a total of seven quilts to incoming STEPS students. More than anything, Budd hopes that the students who receive the comfort blankets know they were “made purposefully,” just for them. For her, one part of the process stands out among others. In that moment, a quilt’s story comes full circle. STEPS is the first full-time residential program in New England for youth transitioning out of foster care. It provides a supportive campus environment for students so they can earn a college degree, develop work skills, and experience optional counseling and guidance support. CSJ solves logistical problems foster youth traditionally face by offering year-round housing and meal service. STEPS students also have access to career and personal counseling. The STEPS program greatly exceeds the national average in both graduation and persistence rates for foster care students.